Yes, I know it sounds like an oxymoron but just stick with me for a moment. US peak electricity consumption occurs during the summer months when the demand for cooling is high and the efficiency of heat pumps drops with the higher ambient temperatures. Air conditioning constitutes approximately 15 % of annual US electricity consumption. However, the proportion of demand on peak days in hot states is in fact much higher. Supplying peak power is very expensive for utilities because they must build the infrastructure to cover peak demand which otherwise sits around underutilized. As a potential means of peak shaving we can examine the use of solar power to provide cooling. In this case utilities could be persuaded to offer businesses and home owners incentives to install such systems because it would improve their bottom line. The introduction of net metering with variable electricity prices could also provide an impetus. In the current environment of fixed rate electricity the consumer has little reason to purchase such a system. Pair a photovoltaic array with a standard air conditioning unit. Pair a solar thermal collector with an aborption chiller. A photovoltaic system would power a conventional air conditioner (heat pump) with the aid of an inverter. Generally the system should be grid-tied so that if the PV system is insufficient or if cooling is not required electricity can be transferred to and from the grid. A solar thermal system would use a collector to provide hot water for a single effect absorption chiller. Absorption chillers differ from common compression chillers in that cooling is driven by heat energy rather than mechanical energy. Aside from the plumping, several pieces of ancillary equipment are necessary including a controller, a pump, and a drain-back/expansion tank. Both systems are capable of providing hot water in addition to their cooling functions. For the PV system, a Heat Recovery Unit (HRU) would be used to pre-warm the water using waste heat from the heat pump. Some further explanation of absorption chillers is warranted given that they are relatively uncommon. 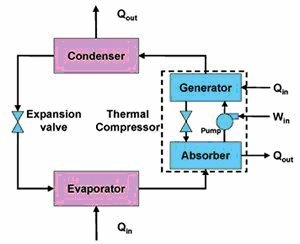 An absorption chiller transfers thermal energy from the heat source to the heat sink through an absorbent fluid and a refrigerant. The absorption chiller accomplishes its refrigerative effect by absorbing and then releasing water vapor into and out of a lithium bromide or ammonia/water solution. The process begins as heat is applied at the generator and water vapor is driven off to a condenser. The cooled water vapor then passes through an expansion valve where the pressure reduces. The low-pressure water vapor then enters an evaporator, where ambient heat is added from a load and the actual cooling takes place. The heated, low-pressure vapor returns to the absorber, where it recombines with the lithium bromide and becomes a low-pressure liquid. This low-pressure solution is pumped to a higher pressure and into the generator to repeat the process. Schematic of Absorption ChillerSingle-effect absorption chillers are not available for residential applications. Typically they are large units designed to operate off industrial waste heat. Small propane powered chillers are typically double-effect units that require a higher operating temperature than solar thermal collectors are capable of providing. The performance of air conditioning systems is expressed by their coefficient of performance (COP). COP determines how many units of cooling/heating you get for every unit of energy you put in. Because units move heat the COP can be in excess of one. A typical value for a air conditioning heat pump is about 3.5 compared to only 0.7 for a absorption chiller. The COP of an absorption chiller is heavily dependant on the applied temperature. If the solar thermal system is only capable of producing tepid water it will not function effectively. For my analysis I will assume that the absorption chiller requires an input temperature of 85 oC compared to the typically 55 - 60 oC required for residential hot water. The obvious conclusion from this is that the cheap unglazed flat-plate solar thermal systems used to warm pool water aren't going to provide the temperatures we need. Instead, we have to move up to evacuated tube collectors. The absorber is insulated from the air by a vacuum. This greatly decreases convective losses to the wind. The absorber is coating with a spectrally selective surface. Such a surface has a high absorption coefficient (α ~ 0.9 – 0.95) in the visible wavelengths (550 nm) but a low emissivity coefficient (ε ~ 0.02 – 0.08) in the far infra-red (10,000 nm). This reduces radiation losses to a minimum. Heat is transferred from the absorber to the working fluid by means of a heat pipe. A heat pipe is filled with a partial pressure of water, such that it boils at 30 °C. When the water evaporates, it convects up to a heat exchanger where it condenses, transferring its energy to the working fluid. The effective thermal conductance is roughly 10,000 times that of a solid copper bar. The heat pipe also has a diode function, in that if it is not hot enough to evaporate the water, no convection will occur. Amusingly they come out to being almost exactly the same. Assumably the inverter losses and parasitic heat losses are small and roughly equivalent. Presumably if you did an entropy analysis this would fall out quite naturally. Since the performance of each system is equivalent it is going to come down to cost. This is ignoring mounts, plumbing and wiring for both the solar thermal collector and PV array. As we can see it is the cost of the evacuated solar collector pushing it above the PV solution. The expensive nature of evacuated solar thermal tubes is probably due to both their complexity and their low production volumes. Since they don't appear to be superior in this role now it seems unlikely that they would ever be able to catch up. Very interesting. Where did you get the price on the evacuated-tube collectors? From what I can calculate, your figures for collector cost/area are about US$4170/m^2. This is really high for something which is mostly glass; I would expect large potential for cost reductions with increasing scale. An 8-tube (roughly 2.1 m^2) Sunda Seido 1-8 collector costs only $2528 bundled with other system components; that's only about $1220/m^2. I doubt that this is the lowest such units could go if they were being made by the millions per year. That would give the advantage to the absorption system. The other side of the coin is that the absorption system can't do much else besides heating air and water, while the PV-powered A/C could use its PV to run anything else. The total utility of the two systems is not directly comparable. And scroll down to the lower right hand corner you'll see a 2005 pricing guide for Apricus evacuated tube collectors (in Canadian dollars). The Apricus prices are slightly lower per square meter but don't include a heat exchanger compared to your Sunda package. Understand that I normalized the price of the collector by the COP of the cooling device. That hammered the cost efficiency of the evacuated collectors quite severely versus PV. Debating whether an mass manufactured absorption system could compete is irrelevant. If it cannot compete now it will never acquire the necessary market share to generate a significant cost reduction. PV on the other hand sees a 0.85 price decrease with every doubling of production capacity. The solar thermal solution can't catch up. What about self pumped fresnel concentrated thermoacoustic cooler? To lower peak grid usage as an assist to existing AC. The only moving parts would be a for solar tracking and auxilary fan/pump to move secondary circuit working fluid. This could be pv powered or a linear generator (halbach array?) integrated into a cascaded tae. I have gone through the costing for collectors including for Sunda. The above will make the project viable. I have seen a residential absorption chiller. It is made in Chine and the smallest size is 4.6 ton. The company name is Broad and the model name is BCT. I went to China to take a look and I was impressed with the quality. Consider a minimum moving parts system, lithium bromide, double effect, 10 ton unit for larger domestic homes in the sun belt, parabolic trough collectors, thermal chimney circulation, 2 story homes, with a cost constrain of 2x conventional, $70 per barrel cost of fuel and utility rates raising from 12 cents per kwh to some 15 cents in two years. This all is very interesting. Can someone tell me whether the cooling effect is same in a 5ton conventional compressor air conditioner and absorption chiller air conditioner. Let us consider a location with 1674 btu/ft2. Interesting assessment - I've done similar comparisons, and the results aren't definitively in favour of PV or solar thermal cooling. Also desiccant evaporative cooling (DEC) can be very economically favourable - by treating the latent load directly, which is more effective than cooling air below its dew point to dehumidify, and then heat the air again. You also have to consider maintenance, design complexity, and warrantees in any comparative analysis - for the moment PV A/C beats solar thermal air conditioning. This will change, but PV costs are expected to be reduced (remains to be seen). Any queries, I'm happy to respond. I found this site mainly as I was searching for a way to dump the excessive heat that the Sunda or Apricus solar tubes would generate in summer. Currently, the residential design criteria calls for calculating the maximum summer DHW need--not a great solution since this year it was only about $15 in July with natural gas water tank where I'm located. But, since I have a radiant floor system, the winter need is where the savings are--this year about $200- in January. If there is a residential application that uses the excessive summer heat generated by the solar water heating system for cooling, I want to know about it! As the importer and distributor for SUNDA evacuated tubes in the USA I must inform you that your prices are not accurate. No one seems to be contacting the source for accurate pricing or product information. Also, there are strict commercial contracts in place that prevent non-authorized sales of SUNDA products into the US market. I suggest anyone thinking about this contact their attorney about ramifications. The project of building a solar cooling system for a greenhouse in a tropical country sounds really interesting. cwilfrid, could you please go in deeper detail? You mention a setpoint temperature of 20 degrees: it is actually temperature that you want to control? Do you have any idea of the outside humidity at day and night (they can be very different depending on the lcoation) and do you want to fix a setpoint for relative humidity of inner air also? I read your information with interest re: solar cooling and a offbeat solution to attain better temperature using solar heating is to use a small or equally sized electrically driven compression system that will supply the additional heat requirements and also provide the mechanical advantages of single use evaporator and condenser fans for both circuits of refrigeration. Anymore info on domestic size absorption chillers? I know that private resorts in hot areas, such as the caribbean, would be very interested in this technology. Especially as it's very green and a zero carbon technology. If you are looking for a low cost evacuated tube solar thermal collector go to www.americansolarworks.com. Only $769 gets you 2.86 sq m of collector. Less for orders over 10 collectors. Where are can buy this ? But amorphous cell copper-indium-gallium-diselenide (CIGS) photovoltaics still perform well in lower light and incident angles. If projected sub-$1.50/pk-watt pricing from Ascent Solar, Nanosolar, etc. are correct a CIGS-PV/inverter/heat-pump may comfortably beat an evacuated-tube/absorption system on system price/performance. But not reflected in the analysis is the cost and efficiency of energy storage though. Insulated tanks are cheap & efficient compared to any battery technology. It may prove more cost effective to use an under-sized evacuated tube collector to store thermal energy during non-peak cooling days for use during the heat-waves (or in the evening hours.) Peak cooling load typically lags the peak insolation by a few hours, which means a grid-tied PV system without storage must be proportionally over-sized to meet peak demand. Even with the prospect of inexpensive CIGS PV it may still be cheaper to run with evacuated tube/absorption. This can't be done on the back of a napkin- only real system designs match to actual system-loads can determine the minimum system sizes & costs. But no way does matching peak-watt-PV to peak-watt-thermal make sense. Peak-watts is a poor measure of total system performance when comparing vastly different technologies. I have a small dairy in Vermont- we make artisinal cheeses that go down to NY City restaurants. We have a cheese aging room that matures the cheeses and i cool this with a small chiller( 1-1/2 tons ) which pumps chilled water through some converted copper solar panels which line the walls. The walls are solid concrete blocks making a large thermal mass with an R35 insulation envelope on the outside. In the winter the same system distributes warm water to keep the room at 50F all year round. I worked with a small chiller company and their engineer to get a version of their mini-chiller which they were supplying to nite-clubs to chill vodka cocktails to below freezing before adding the mixer! The room works very well and the unit has been tuned by the cheese-maker over the past year to produce the conditions perfect for our cheeses. and i figured the unit would be powered by an evacuated tube collector which would also make hot water- the cheese making process uses a lot of hot water for washing and cleaning etc. Both requirements would be backed up by the existing plant when solar hot water is not available, however, the thing that appeals to me greatly is that our demand for cooling - and hot water to an extent- occur when this system would be most efficient. In my inital critique of the photovoltaic/thermal back-of-napkin analysis I neglect to mention just the quite significant temperature derating factor of photovoltaic cells: They lose output at the rate of about a half-percent of rated output for every Celsius degree over 20, so when you need it the most, you have the least power available. Typical PV installations run 20-25C over the ambient air temp, thus to design for a 100F/40C day the array would be running around 60-65C, producing ~40 x 0.5%= 20% less power than labeled. For every 1000W of DC power you'd need 1250W of panels- 25% over-sizing. And as the temperature rises (and you need more power), it just gets worse if you want to keep up. By contrast, with thermal collectors higher ambient temperatures make them less lossy, meaning MORE usable power is available- the curve is at least in the right direction. Again, photovoltaic watts vs. thermal watts can't be rightly compared exclusive of a REAL design. But the efficiency trends are in the wrong direction for PV, in the right direction for solar-thermal. The actual size of the "comparative" arrays will vary depending on the actual design parameters. Another side to this idea is to increase the amount of water or home heating by the extra heat pumped from the cold end of the chiller, which in this case should be groundwater. Probably with ground source you could do better than the 0.7, but even in that case the amount of heat produced would be increased by factor 1.7. Since the chiller is much cheaper than the collector system, this seems worthwhile, although perhaps it is not competitive with lower-technology collector systems directly producing not as hot water. The analysis of solar thermal cooling didn't mention glazed flat plate or CPC models. These are less expensive per square foot and produce enough summertime heat to drive the absorption chiller. Coupled with the enhanced water heating capability of solar thermal, I would think the total building energy load would be reduced going this route versus the PV route. i'm no engineer, but two heat sinks seem very appropriate for homes in the humid sunbelt: (1) Even assuming dometic hotwater will have its own flat panel, consider that that most pools require heating (for us southern folk!). So, forget the flat panels for the pool and use the pool as the needed heat-sink. And for those days when you want to cool the pool, do that at night with sky-facing radiate panels. (2) try collecting the 60" plus rainfall into large underground cisterns and use the earth as a thermal moderator. I am finalizing the engineering for my own green home and hope to use both ideas. - High-temperature (>70°C but 95°C yields higher COP) generator heat source. - Low-temperature (<10°C) produced at the evaporator at a COP of 0.7 (single effect) from the generator. - Warm-temperature (=~ 30°C) heat output at the condenser that needs to be evacuated in the amount of 1.7 (single effect) times the energy of the source. The later needs to be heat-sinked and is a major problem. In other words, 1.7 times the power of the solar collectors needs to be sinked during peak cooling-load. This requires either a (relatively large) cooling tower that will consume large amounts of water (if available and environmentally acceptable) or some source of ground source heat sink that will add to the cost and might heat-up the ground after a few years in operation therefore reducing the efficiency (COP) of the absorption chiller. Their are also absorption chillers evacuating condenser heat in the atmosphere with an electrically-driven fan but this reduces the COP of the absorption chiller significantly once outside temperature rise above 30°C, which will of course happen during peak cooling-load. This is a major problem that needs to be addressed according to local conditions. Adsorption (with a 'd' instead of a 'b' in the second letter) Chillers (http://en.wikipedia.org/wiki/Adsorption) using a desiccant might be more efficient (I have not evaluated these so far), as mentioned by Warwick, because these would not require to sink the heat produced by the solar panel and would require to sink only the heat extracted from the building. This would be a major advantage for this technology. - and finally night radiative cooling with a thermal storage. Night radiative cooling sinks heat to space (through air) by radiation at a rate of about 100 to 200 W/m2. The cool fluid is stored for later use (the next day or later) in a thermal storage which can be an underground water tank or a direct geothermal heat-exchanger. Night radiative cooling could be used to cool-down all year long a geothermal heat sink which temperature would otherwise increase after sinking the waste heat coming from the condenser of an absorption (or adsorption) chiller. Radiative cooling could also increase significantly the COP of any ground-source heat-pump decreasing the cost of equipment and reduce the electrical power required making a PV-powered heat-pump cost-effective. After reviewing the data from an adsorption chiller (http://smartenergy.arch.uiuc.edu/pdf/clearinghouse/adsorption%20chiller.pdf page 11 required chilling capacity) I have to conclude that unfortunately they require to sink as much heat as absorption chillers (energy from input heat plus the energy extracted from the building). The only advantage of adsorption could be to avoid the risk of crystallization which could stop an absorption chiller. Therefore adsorption chillers also require an oversize cooling tower consuming excessive amounts of water or a geothermal heat-sink that in turn will need to be cooled down to avoid a reduction in COP over the years possibly with night radiation cooling. Look at the new DC compressor driven air conditioner from Solarpanelsplus. EER of 30. The cost per watt/ton of cooling, when driven by a 3 panel PV array are pretty attractive. In the winter you can sell the surplus power back to the grid. I have been looking at the latest info on Solar Cooling. It seems that the guys at The Australian National University are coming up with the simplest system that I have seen so far. It still works off Evacuated Tubes or Flat Panels and is far simpler than Absorption, Adsorption or Dessicant cooling. Not only are these efficiencies very low but these cycles require to sink an enormous amount of heat at the condenser equivalent to amount of heat extracted from the load plus the heat used to power the cycle - i.e. about 8 times or more the amount of heat extracted -. The heat at the condenser is further more difficult to sink that this low-grade heat (about 30 degrees Celsius) requires very large fins and/or a source of water. The fins alone would not provide any condensing power in hot climates where daily temperature rise above 30 degrees Celsius resulting in even lower efficiencies and a dramatic decrease in cooling efficiency as temperatures rise. To make these cycles usable for air conditioning use, efficiencies would need to be dramatically improved and condenser temperatures should be at or above 50 degrees Celsius. The original post is quite old now, but for the sake of ease I'll use your numbers and ask, what happens if you already have an evacuated tube solar hot water system? This would subtract the $1.99 from the equation yeilding $0.50/w which handily beats PV+heat pump. I live in Seattle and the Solar HW system is designed to be sufficient all year round, which means its excessive in summer, the system has a heat dump to get rid of it. So theres some energy there to be used. (20 tube thermomax). I already have PV+heat pump anyway, but I hate the idea of all that waste energy going out a heat dump. When I was young, I spent some time on sheep stations in rural (outback) Australia. We had kerosene fired refigerators, a little bit of heat to provide some cold, which got me wondering what could be done with the heat dump on my HW system, and led me to your blog. I couldn't find any information on Yakaza chillers (in 30 seconds on Google), do you have any current thoughts on chillers? The greenhouse will be built in Suriname, a country in South America where the temperature is about 30 C all year. greenhouse temperatures would ideally be around 20 C.
Energy Efficiency leads to ... Wealth?